Saturday, March 5, 2016 - Dust whirls (or mud splatters) over the Tuscan hills. Strade Bianche is underway on unpaved roads, often on twisting gravel paths and firmly uphill. Riders toil on over 52.8 kilometres of dust (mud) roads, while the parcours of Strade Bianche 2016 totals at 176 kilometres. Unlike last year, when riders left from San Gimignano, edition 2016 starts in arrival town Siena. Riders get on their bikes and leave the ancient town to enter a race with medieval characteristics. In the rolling landscape of Tuscany the toughest sections are on unpaved roads. The first one comes with slighlty over 10 kilometres done. It’s the 2,1 kilometres gravel sector Vidritta: a long straight road straight through the fields offering a solid way to get warmed up to the hardships ahead. 39.8 kilometres into the race the second ‘white strada’ is harder when the riders are blasting on narrow and winding unpaved roads for 5.5 kilometres. Good positioning is the motto here. Around 10 kilometrets after the climb up to fortified town Montalcino the longest dust sector lays waiting. Lucignano d’Asso totals 11.9 kilometres on winding roads with fields and forrest left and right. Only 2 kilometres after this toil the next white roads bring something extra to the mix, which is climbing and descending for 8 kilometres. The mix is cut down to the climbing bit with 103 kilometres done when narrow gravel roads go up for 9.5 kilometres. Next comes the Monte Sante Marie section in 11.5 kilometres, taking the riders back to last year’s route. It’s a good spot to attack as the strip features nasty climbs and descents. But one mistake and you’ll hit the earth. The finale starts with a 0.8 kilometres dust sector. Too short to make a difference, but perfect to test the competition. With around 157 kilometres done Strade di Colle Pinzuto is next – 2.4 kilometres of unpaved road opening with a steep climb and a max grade of 15%. The last gravel road opens with a descent and closes with a climb featuring a steepest section at 18%. It’s a 1.1 kilometre slog and then it’s time for the endgame. If any escapees are adrift, the winding roads of Tuscany favour the daredevils as chasers will have difficulty pinpointing them. With 5 kilometres left the road goes downhill, only to go back up again in the last kilometre. Entering the city walls of Siena, a 16% sector welcomes the riders. Then a sharp turn to the right, left and right again. The finish is at Il Campo, Siena’s famous square. 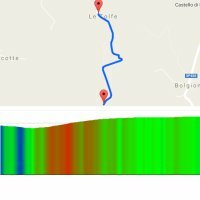 Race results/race report Strade Bianche 2016.